By thoughtfully analyzing such factors as what your customers are trying to accomplish and what action(s) you hope to influence them to carry out when they visit your website, the skilled web designer will gain the insights needed to combine the right creative elements and web design technologies to craft a website that will help you achieve your objectives. At Digital Shifters, we create a balanced blend of the artistic and technical, effectively meeting both your customers’ needs and your business’s interactive goals. On top of all that, our web design services provide your company with a measurable return on investment, giving you a concrete way to calculate the value. We’re proud of our experts’ ability to create the optimal web design strategy for your website by melding the fundamental web design principles that are indispensable to quality craftsmanship with the most up-to-the-minute graphic design trends that are grabbing the attention of today’s website visitors and inspiring them to buy. At Digital Shifters, we are a Charlotte web design company that takes our charge seriously, putting all our creative and technical resources to work to create the perfect balance between look and feel, between aesthetic appeal and practical value. This is the way we create a website your prospects and customers will love. Digital Shifters develops a wide range of strategically designed websites for our clientele. 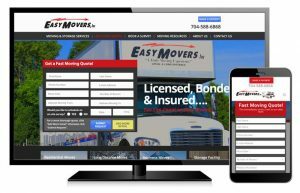 Our sites are not only user friendly, but they also incorporate the responsive design elements that seamlessly reformat your website for each user in real time, ensuring maximum usability on all devices — a factor that has been shown to increase sales. The sites we design include content-managed websites, ecommerce sites and microsites that are tied to campaign-specific landing pages. Because a properly designed website can attract a significant amount of new business for your company, your website is not an aspect of your business that you wisely leave to chance. Let our web development experts provide the perfect website for your business, custom-designed and strategically configured to meet your marketing goals. You’ll never have a second chance to make that great first impression. We’ll get your design right the first time so you can make the kind of impression that commands immediate attention. A website is no longer a luxury. It’s an indispensable tool that your current and potential customers expect you to provide to establish your ability to meet their needs. Since all our websites incorporate responsive web design, they’ll look as good and work as well on a mobile phone or tablet as they do on a laptop or desktop PC. A professional website will help you rank near the top of your industry while challenging your competitors to keep up. Get in touch with Digital Shifters today to find out how much of a difference professional-quality website design can make to your business.